Our unconscious reactions can be pretty predictable. You would certainly recognize your signature on a piece of paper, but do you know your own emotional signature? We all have one. It's our predictable way of reacting to situations. Your friends probably recognize your emotional signature better than you do. When you get into a fight with your partner, for example, they can predict just how it will go. They know if you're likely to slam a door, storm out of the house, or call your mother. They know if you'll be processing the argument for days or immediately shut down and clam up. How do they know so much? They know because they've seen it all before. Our behavior may seem spontaneous to us, but to those who know us, we're not too surprising. Why don't we pay more attention to understanding our own patterns? We may have a solid financial plan worked out that will buy us a house, pay for our kids' college and our retirement, but we don't give much thought to getting the most benefit out of one of the most precious resources for happiness -- our emotions. Often, we just leave it to chance. We may not like to admit it, but we're creatures of habit. We have our daily routines all worked out. It's how we keep our busy lives simple and convenient. We don't have to decide every day whether we'll walk to work, take the bus, or drive. We even fall in love and handle our relationships in predictable ways. Just as we have our daily routines, we have habits of thought and feeling that keep our emotional life simple. We don't have to guess who's going to pay the bills and who's going to spend most of the money (although we may talk about it a lot). We have our own special ways of telling our partner, "I'm annoyed with you, don't talk to me," or "I'm bored, so I'm not really hearing anything you're saying." When we're hurt, scared, furious, or jealous, we don't have to figure out how to show it. Our emotional triggers are set: they go off in the same ways again and again, carrying us to the same places every time. If we have a habit of blaming, we accuse. If we have a habit of withdrawing, we disappear. If we have a habit of controlling, we threaten. Everyone else we know may be able to predict how our patterns will play out, but we're often blind to the process. Even when we can predict how we'll react, it usually doesn't change the outcome. There's a popular saying that the definition of insanity is doing the same thing over and over and expecting different results. We resist the idea that this anger or thisjealousy isn't justified. We may not like it, but we don't see how to avoid pulling the trigger. In spite of all the challenges they pose, there's nothing wrong with having emotions. Emotions are a fundamental part of who you are --- an expression of your basic intelligence and creative energy. When you can explore and get to know them without reacting immediately to their energy, they can be a source of wisdom and compassion. They can open your mind and your heart. They can lead you beyond your habitual patterns into new emotional territory. They can teach you generosity, patience, and courage. It's only when you don't allow yourself to feel your emotions or when you distort their energy that you can get into trouble with them. When we operate primarily on the basis of our habitual patterns, we run into problems. At the first flush of emotion, we move so quickly into our habitual ways that we completely miss that first moment. It was so authentic -- it could have told us so much. But we never even saw it or felt it. We've already lost touch with the fresh, creative energy at the core of our being and skipped to our usual way of expressing our anger or jealousy. The regrettable words have been said, the door has been slammed. We're also very judgmental of our emotions. If we think they're too raw, if we think they're impolite, we try to dress them up with positive thoughts and make them more respectable. When we manipulate our feelings this way, consciously or unconsciously, we're trying to get them to match up with our familiar emotional signature. But that's just another way to lose our connection to their vitality and wisdom. If our partner hurts our feelings, offends us or shocks us, we can't even name the intense emotions we feel at first. The feelings haven't yet formed into anger or any other solid emotion. For a moment, we're suspended in a space of pure openness, where anything is possible. If we can just stop and remain in that space for a moment -- without any answers or judgments -- we have a chance to connect with the wakeful qualities of our emotions and hear their message. Especially in crises of the heart, our emotions are the first responders, but if we jump to conclusions too soon, it's like we're ignoring their instructions. They're trying to tell us which pathways are clear, and where the emergency exits are (this way to insight, that way to humor -- and if all else fails, leave before you do something you'll regret). If we don't pause and listen to our emotions, we might just end up running back and forth in a burning building. If we're going to understand ourselves, much less another person, we have to look beneath our patterns and face our emotions in their natural, undisguised state. When we're stuck at the level of our habitual dramas, it's like going through the day half-awake, barely conscious of the world's brilliance. Some part of us may like this half-asleep state, where nothing is too bright, too energetic, or too unknown. But another part of us can hardly wait to be free, to take a chance, to see what's on the other side of the mountain. How do we get unstuck from these patterns so we can respond to our experiences spontaneously? We don't have to change everything about who we are and what we do. We just have to bring awareness to our thoughts and emotional reactions. We can take one small step at a time towards waking up in the present moment. That's where we hear a note of music and feel its life force. It's where we enjoy a laugh, soothe our aches and pains, and feel our heart opening. Everyone's emotional signature is different, but we all share the experience of being alive. We all know the joys and sorrows of love and hate, hope and fear, altruism and self-centeredness. And we all instinctively know that life, despite all its challenges, is precious. So, it just makes sense to look into the life we have and find ways to make it as meaningful and happy as possible. After all, we don't throw money away or put artwork in the trash with our junk mail! We take great care of our personal assets, and one of our most valuable and misunderstood resources is our emotions. To become free of the unhappiness they can cause in our relationships, we only have to respect and accept our emotions, moment by moment, and be willing to work with them. 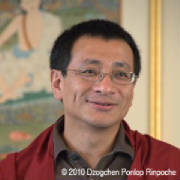 Dzogchen Ponlop Rinpoche is a widely-celebrated teacher and author of "Mind Beyond Death" and the ultra-relevant "Rebel Buddha."